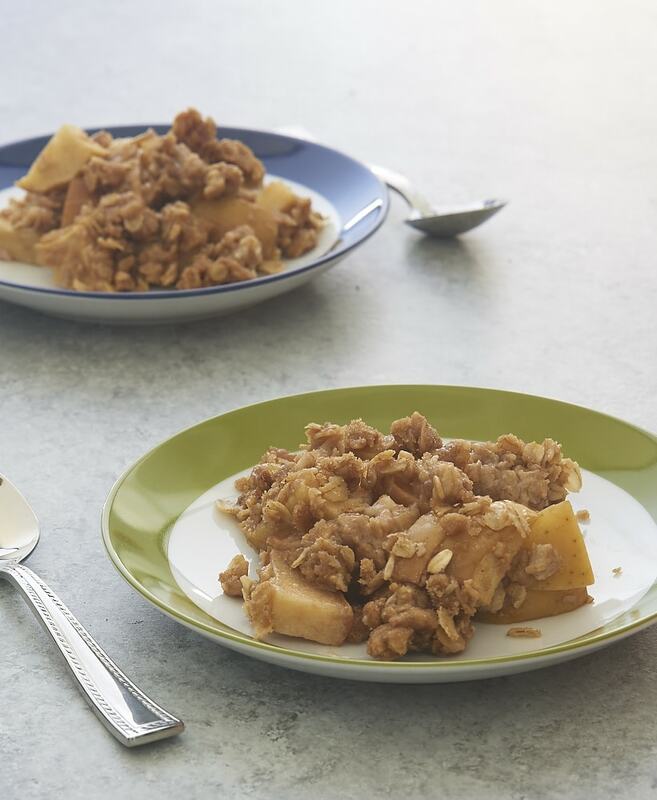 The arrival of apple season means that this Apple Crisp will get made at least a few times around here. It’s so simple to put together and so very tasty that it’s a great go-to dessert recipe when you want a warm, sweet, comforting dessert. The filling really couldn’t be simpler. It’s made entirely of apples. Nothing else required! Keep in mind that not all apples are great for baking. 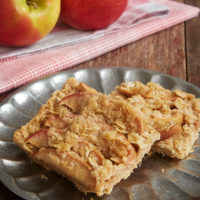 You want to look for apples with a good sweet-tart flavor and with a nice texture that won’t let them fall apart while they bake. Pink Lady, Fuji, Gala, and Jonagold are my go-to choices for the best baked apple desserts. The crisp topping is really, really good. Seriously. I think I could just bake up a big pan full of it and eat it all on its own. 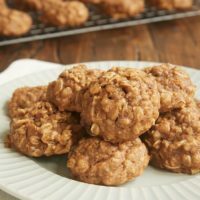 There are plenty of oats, brown sugar, and butter, along with some spices to make it pretty spectacular. 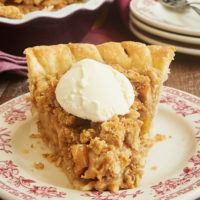 I’m not a huge fan of ginger, but I love the little bite it adds to the topping. It really rounds out the flavors perfectly. You can serve this crisp warm or at room temperature. Honestly, I wouldn’t turn it down straight out of the refrigerator, either. Add a scoop of ice cream or a dollop of sweetened whipped cream if you like. Then just grab a spoon and revel in its deliciousness! Preheat oven to 375°. Grease an 8-inch square baking pan. Spread sliced apples in prepared pan. Stir together the oats, brown sugar, flour, cinnamon, nutmeg, ginger, and salt until combined. Add the butter and mix with a fork or your fingers until crumbs form. Sprinkle evenly over the apples. Bake 30 minutes, or until the top is golden brown and the apples are fork-tender. 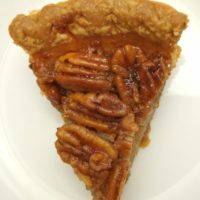 I could sooo go for some of this right now. I’m freezing and this looks like the perfect comfort. After looking at the recipe I think I would bump the cinnamon up to 2 teaspoons and reduce the nutmeg to a 1/4 tsp. Yum! 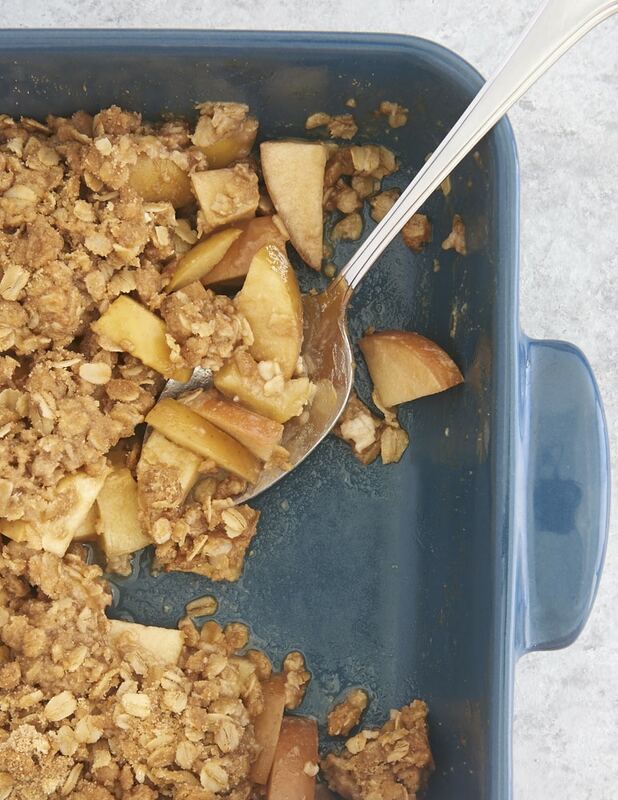 I’m a big fan of apple crisps and most fruit crisps/cobblers/crumbles and yours looks wonderful. You make cinnamon ice cream!? I’m drooling as I imagine the combination!